"Probably the best bookstore in the world"
We are an independent bookstore in the Midwest, family owned. We specialize in EVERYTHING, so come to us for all your books needs. We're here to help. 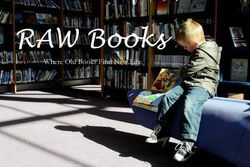 Terms of sale for RAW Books 30 day return guarantee, with full refund including original shipping costs for up to 30 days after delivery if an item arrives misdescribed or damaged.